When the sun goes down, typical optical devices begin to strain in their ability to provide crisp clear images. This is where infrared binoculars pick up from. These night vision devices will amplify every little light they can get to bring an image into focus. 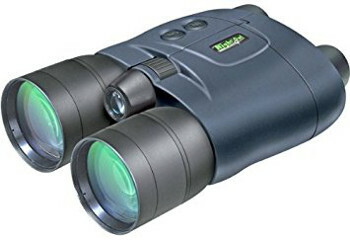 The best infrared binoculars can be used for hunting, camping, nocturnal wildlife observation, boating, astronomy, law enforcement, property management, security, and surveillance and search and rescue missions. Unfortunately, the binocular market too is rife with all sorts of night vision devices to the extent that choosing one elicits the feeling you get when sitting for an exam for the first time; fear and doubt. You don’t know which one will best suit your needs. Without proceeding with caution, you can easily end up with a product that will not do what you bought it for. We have taken our time to sift through various products in the market to bring you the best infrared binoculars available. We have reviewed for you nine products that we believe will wow you and still make it possible for you to pick one or several. Our list includes devices from different manufacturers. Infrared binoculars should not be confused with night glasses as they go further than just being optical devices. They bring things that are far closer in the dark. Also, they are different from an ordinary pair of binoculars as those will only allow you to see objects when there is adequate light. Infrared binoculars are also not designed to be used while in motion. This owes to their low magnification. This means that you cannot mount them on your head. From far, they look like a normal pair of binoculars. They are designed to allow you to see, in the dark, a fair distance. The following table outlines a brief summary of the main features present in the nine products we have reviewed in here. This serves those who are busy and may not be able to comb through the whole review. If you are a pro shopper, then you know how essential it is to know what you are looking for. So, what deserves consideration when shopping for the best infrared binoculars? The power of magnification should never be undervalued when looking for a great optic device. The power you choose will determine how far and clear you’ll see. Most night vision binoculars come with a power of 2X which is sufficient but if you can get 5X, even better. One of the features you want to look at is the distance. Check that the binoculars come equipped with an infrared illuminator, this is what will allow you to see into the distance in the dark. Look at the quality of the glass optics and lenses, they are the difference between high performance and mediocre performance. 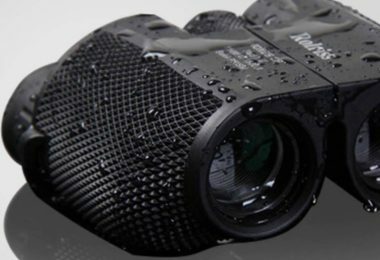 A good pair of infrared binoculars should be able to withstand constraining weather elements. This means that they should not just be waterproof; they should also be fog proof. 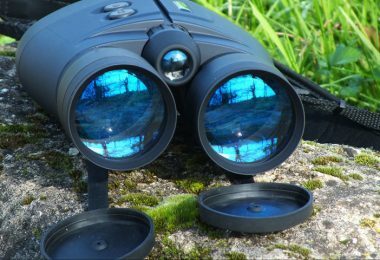 Good binoculars should allow you to clearly see when bird watching, sporting, hunting, and other similar occasions. If you want an infrared pair of binoculars that is the highest quality, you will certainly want to look at the field of view. The pair you buy should not be one that is difficult to adjust. You should be able to adjust quickly. Although this comes as an additional feature in high-end models, it’s essential if you know you will be hunting in the pitch dark nights. You will be able to nail your target with ease. A photosensitive cathode generates electrical impulse faster when subjected to light thus generating better quality images in the dark. 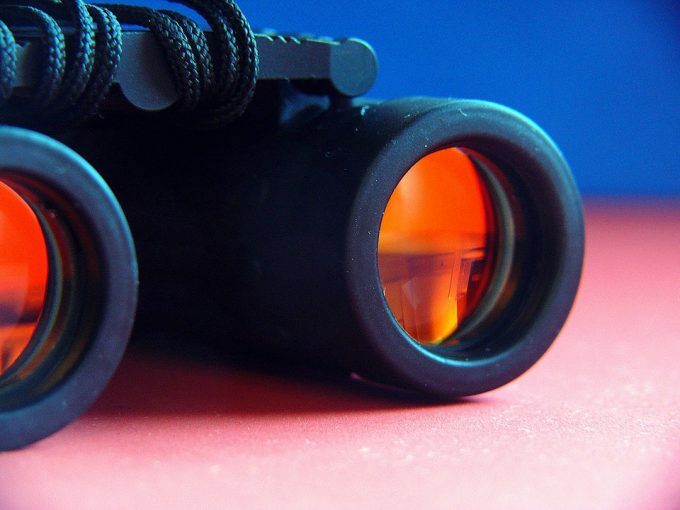 Now that you have a good idea of what to look for in a pair of infrared binoculars, let’s go ahead and dive into some reviews. All of these options would be great choices, but you’ll have to check out the one that is best for you. The Spy Net Night Vision Infrared have come to be known as the premier when it comes to products designed for spying. They are designed to allow you to see up to 50 feet even when it is completely dark. The pair allows you to benefit from a dual eye display. To use them, you will need to have 5 AA batteries. These would have to be purchased separately. 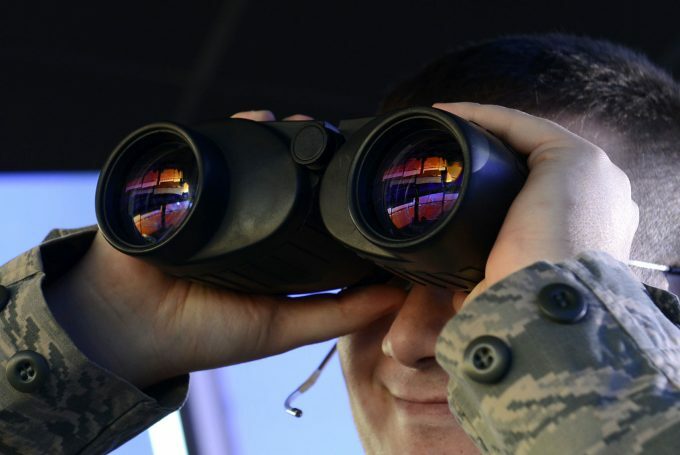 If you ever get yourself involved in recon missions or covert operations, the Spy Net Night Vision Infrared Stealth Binoculars are what the doctor just ordered. This product will ensure that the night will never intimidate you again. The dual display will ensure that you miss nothing even when it is completely dark. The handheld design ensures that you are not slowed down. If you look at the price and the age range that this product is made for, you will agree with us that this is a pretty impressive product. 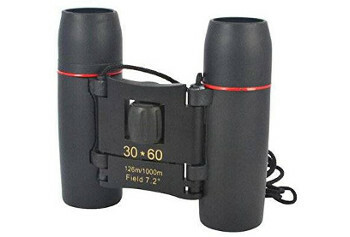 When buying this product, you will need to know that they are a pair of telescopic binoculars. They work quite well when you are looking at things that are far and not so good when looking at objects that are near you. The reason why we recommend this pair of infrared binoculars is that they are able to deliver exactly what they are made for; clarity in the dark. Another good thing is that these binoculars do not emit any light at all. So, if you are watching an animal in the dark, you will not run the risk of scaring it away. Related: Since these run off AA batteries it wouldn’t hurt to stock up with a 20 Pack of AA Batteries. 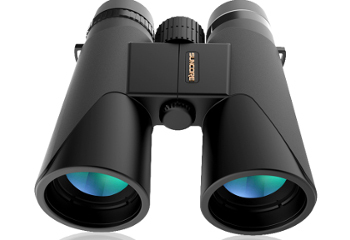 The Factop Black Sakura Binocular is a product manufactured to deliver quality. Whether it does deliver this quality is another story. Even though this pair promises great magnifications, it fails to even meet those that come with less magnification. Using them feels like using a toy belonging to a child. If you are really working on a budget, and you do not care about the fact that they do not work so well at night, you can always go with one of these units. However, do not expect anything spectacular. Related: In order to keep your binoculars spotless and giving you the best views you’ll want to keep it nice and clean. To help out with that consider the Vortex Lens Cleaning Pen. When it comes to any stuff optical, Bushnell is slowly becoming the synonym for great quality. If there is any product that represents this quality, it is The Bushnell LYNX Gen 1. This optic device delivers a clear image with HD elements. The material used to make it have undergone thorough testing to ensure the device will live to provide long-term services. A good look at this product will tell you that the designers were not only aiming at the aesthetics but the strength as well. 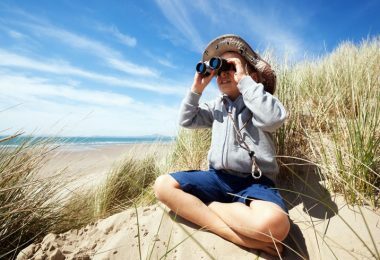 The binocular belongs to generation one (hence cheap) and offers magnifying powers of up to 2X. At 17.6 ounces, Bushnell is lightweight thus great to carry anywhere. The binocular sports a rubberized surface thus providing a good grip for a comfy handling. 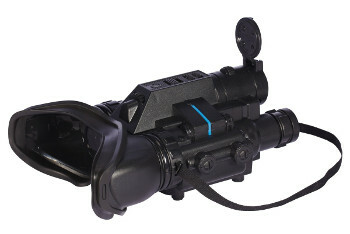 According to the manufacturers of this product, their aim is to take the concept of night vision to a whole new level. Note that most of their products have a wider field of view, longer viewing distances, inbuilt infrared illuminator as well as weatherproofing elements. This should motivate you to try Bushnell Lynx Gen 1 Night Vision Binocular. Some of the features that impressed us about Bushnell Lynx Gen 1 Night Vision Binocular include the built-in infra-red that ensures clear viewing, the wider objective lens diameter( for a wider field of view), and of course, the multicoated optics. Related: Sometimes you spot something amazing and you want to show someone else or get a picture. Luckily there are some items, like the Universal Cell Phone Adapter that allows you to attach your phone and get a picture. If you do not believe that efficiency and affordability can be delivered in the same package, then you certainly haven’t used the ATN Night Scout VX Gen. This product was designed to be affordable without having to compromise quality. We are all told that we cannot expect the best of both world, but this advice flies out through the window when it comes to this product. So what is it that impresses us so much about this product? We love anything that is compact and light weight. Also, this product is durable. If the ATN Night Scout VX Gen CGT Night Vision Binocular provides for depth of perception, we must thank the dual image system of this product. The pair has also been manufactured in a way that makes them comfortable. 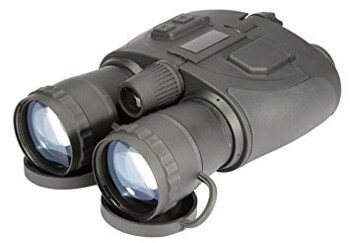 You can buy the ATN Night Scout VX Gen CGT Night Vision Binocular in different configurations when it comes to the image tube. This is done with the aim of accommodating different budgets. Of course, the performance of the pair you buy certainly depends on how much you have paid for it. 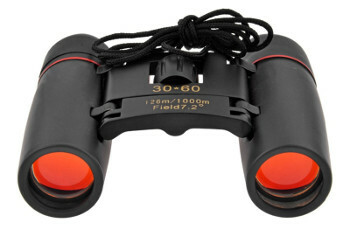 Many reviewers of this pair of binoculars we were impressed by the fact that there is actually no light to amplify. 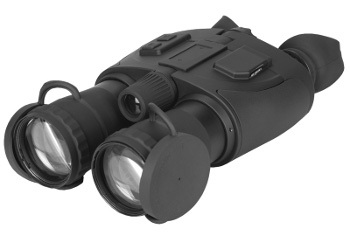 These binoculars ensure that you can see through the dark by deploying an infrared illuminator. 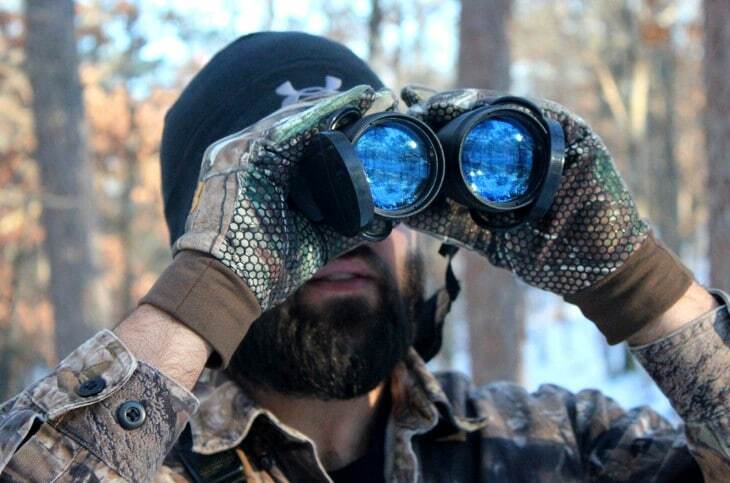 This pair of binoculars is generation 2 even though the Custom Grade Tube actually make it a leader in its class and leaves it competing with products in generation 3. Your brand new pair of ATN Night Scout VX Gen CGT Night Vision Binoculars will arrive in a box that also contains a carrying case, a strap, the warranty card, two batteries and a booklet which tells you how to use the product. Related: Once you invest in a pair of high-quality binoculars like this you’ll want to keep them in a place where you know they will be safe. The Mil-Standard Hard Carry/Storage Case is just the place for you to know that they will be safe and sound. Includes: Large plush carrying case, neck strap, objective lens covers, a lens cleaning cloth and a 1-year warranty card. Anybody who uses the words night and owl in the name of their product just like the manufacturers of the Night Owl Explorer Pro, better deliver on their promise. When we saw these words in the name, we decided to check if this pair could provide a view as good as the one the owl has in the middle of the night. We can report that with its 5 x magnification, it gets close to living to this promise. The reason why the Night Owl Explorer Pro 5X Night Vision Binoculars permits you to see with a great deal of clarity even when it is completely dark is the power made possible by the infrared illuminator. The fact that these binoculars are portable has not made them compromise on performance. This performance is enhanced by the two intensifier tubes. Every optical instrument that wants to be taken seriously knows that its glass has to be of the highest quality. This is exactly what the manufacturers of the Night Owl Explorer Pro 5X Night Vision Binoculars just did. First-class metal oxides accompanied by the best fluorides are the reason behind the clear and crisp vision that buyers have come to expect from this pair. This unit belongs to the first generation. For this reason, we will advise against comparing them to products belonging to later generations. 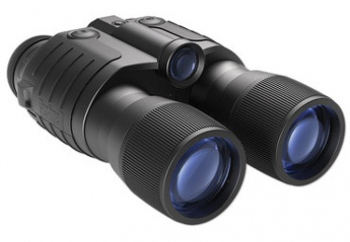 We can certainly recommend the Night Owl Explorer Pro 5X Night Vision Binoculars because when you look at the price, you will certainly agree that you are getting what you have paid for. Related: To keep getting the most clear views you’ll want to keep your binoculars clean. In order to help out with that consider the Nikon Lens Cleaning System. Are you looking for a product that can be defined using the phrases superb quality and fine workmanship in the same breath? Then you have just found one and it’s the SUNCORE Teloon Binoculars. The pair is manufactured from materials that have been specifically selected so that it is not only comfortable to use but also durable and long lasting. The features of this product that impressed us enough to place them in the list of the best products we could find in the market this year include the fact that they are both water and dustproof. Expect no mist when you are trying to look through them. This also means that the chances of mold forming on any parts of the product; ensuring that the image you see is clear all the time. When using this pair of binoculars, the viewing quality is also enhanced by a power ratio that is high. This also ensures that when you are using this pair, the whole process is comfortable. The pair is designed to fit well in your grip and ensure that it is not slippery. Related: When out in the field you don’t always want to hang these around your neck. A padded carry bag, like the Duragadget Carry Case will keep them safe until you need to use them. If you do not look carefully enough, you may be fooled into thinking that the Armasight Dark Strider Gen 1+ Night Vision Binocular is a regular pair of binoculars. This means that you are able to enjoy night vision using a product that is familiar. This is a product for someone looking for a solution that will help them to view for longer periods of time with a great depth of perception. 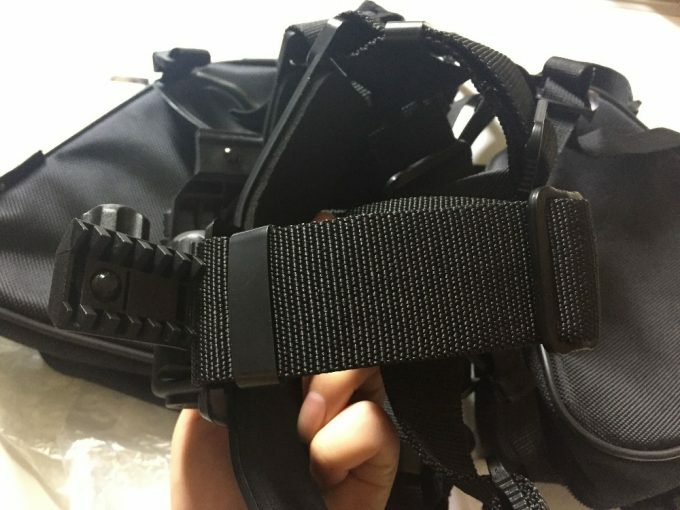 The image tubes in the Armasight Dark Strider are generation one. Expect glass lenses that are multicoated and a housing that is armored and fitted with rubber in order to ensure that you are comfortable when using this pair of infrared binoculars. When you are able to see in the middle of a dark night, thank the adjustable infrared illuminators. Every button on this product is simple to control. Add to this the fact that this product is both fog and water resistant and you have an idea why it is one of the best products available in the market this year. We can certainly recommend this product without a fear of contradicting ourselves because it is long lasting, powerful and practical. All these comes at a price that is affordable. 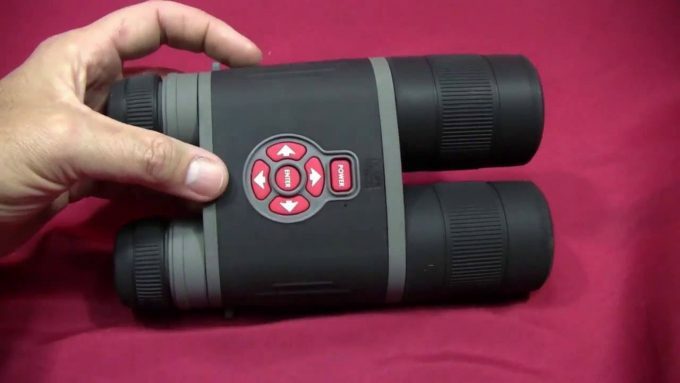 There are a number of things that make the Grandey New Vision Handheld one of the products you should consider if you are looking for a pair of infrared binoculars. The pair will help you see objects in the darkness that you would otherwise have thought were not there. Some of the leading features in the Grandey New Vision Handheld 30×60 Binoculars Telescope include a class-leading magnification of ten times. Expect a great viewing angle which comes at 7.2 degrees. With your brand new pair of Grandey binoculars, you will also receive a lens cloth, waterproof bag, and manual which will tell you how to use. The Grandey New Vision Handheld 30×60 Binoculars Telescope is a product we can safely recommend. Related: You might like to pair this with a Day and Night Multifunction Rangefinder so that you are able to know for sure how far away the object or objects that you are observing are. You won’t be wrong if you call this binocular the “Dark Knight.” It’s got you covered in the dark when you have to spot your prey or view where you are going. The multicoated lens, built-in infrared illuminator and the wide design of their objective lens ensure you don’t strain to get a clear view. 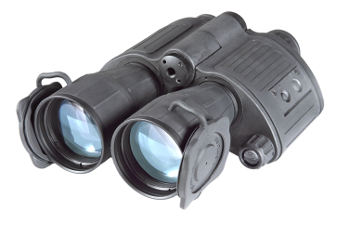 The Rich Tech Infrared Binocular is a long range device. That means you can obtain clear images past the usual 300 feet mark; thanks to its magnificent optics. The material used to build it are light enough to make the device compact, lightweight and portable. Other features that come in handy during night time surveillance include the low battery indicator, the on and off proximity sensor and an infrared lamp. Rich tech’s construction sports material that makes it fog and waterproof. Therefore, no need to conclude your event due to rain if you were not yet done. The device is secured by a 1-year warranty with no questions asked. Related: As this pair needs CR123A batteries that last you about 60 hours you’ll want to make sure you have a few extra ready. Allow us to recommend Streamlight 12 pack. The nine products we have featured above indicate that anyone looking for a pair of infrared binoculars is spoilt for choice. The different products are designed for those who are working within a budget and those who can afford a little more. Whatever the case maybe, to get the right pair for yourself, you need to invest the right amount of time looking through the market. Who knows, you could be lucky and run into a bargain. Make sure you don’t go for the ordinary binoculars; seek help if you don’t know the difference. Have you used any of the night vision devices reviewed above? Do you think we’ve left out anything? Share your opinions with us via the comments section below.